i-THRIVE recognises that delivering improved outcomes requires consideration of the role of implementation across the whole system of services for children and young people’s mental health. Moving towards a ‘THRIVE-like’ way of delivering services for children and young people requires engagement in change across the whole system (blue boxes below). This includes traditional health services (e.g. CAMHS), Social Care, local authority, education, key third sector services and other independent organisations that may contribute to supporting child mental health and well-being. 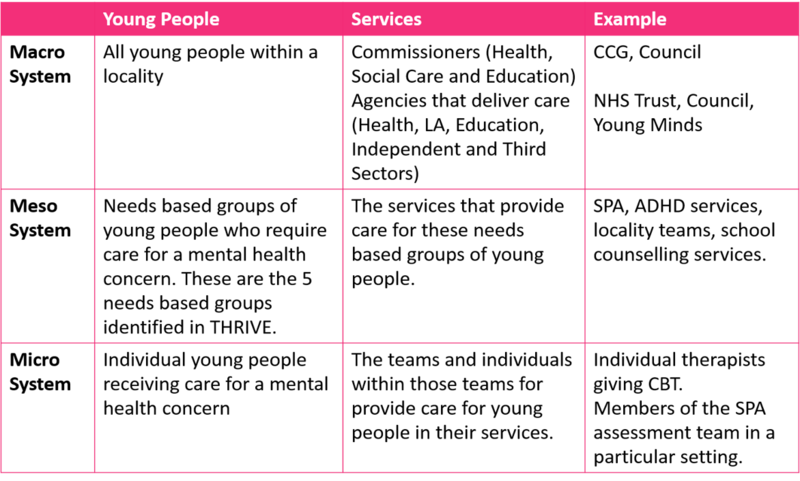 In addition to looking across the system, it is equally important to think about the different agencies/services/organisations within the system at the three different levels; the ‘Macro’, ‘Meso’ and ‘Micro’ levels. At each level you can talk about 1) the children, young people and families and 2) the available support. Children, young people and families: The population health outcomes for children, young people and families locally. Available support: The way in which services are commissioned to meet the needs of local children, young people and families and how different agencies within the system work together to support them. Children, young people and families: The outcomes of the groups of children, young people and families who are grouped according to their needs for care, as described by THRIVE’s five needs groups of ‘Thriving’, ‘Getting Advice’, ‘Getting Help’, ‘Getting More Help’ and ‘Getting Risk Support’. Available support: The different services that support children, young people and families who are considered to be in one of the five needs groups. Children, young people and families: The outcomes of children, young people and families. Available support: The interactions between staff within and across services supporting children young people and their families. Interactions: The interactions children and families have with their clinicians/support workers/case holders. Implementing the THRIVE framework will require thought about how to effectively engage and work with the whole system of local services for children and young people’s mental health and thought about how to involve service users and people working at all three levels, from commissioners to clinicians. The i-THRIVE Toolkit provides guidance on how this may be achieved. This table describes the people at each level.